Taking care of feet is as important as taking care of hands and face. I love pedicures more than manicures 😛 and foot spa is definitely my go when I feel tired after a hectic day and even if I am in a mood to relax then foot massage is what I love most. 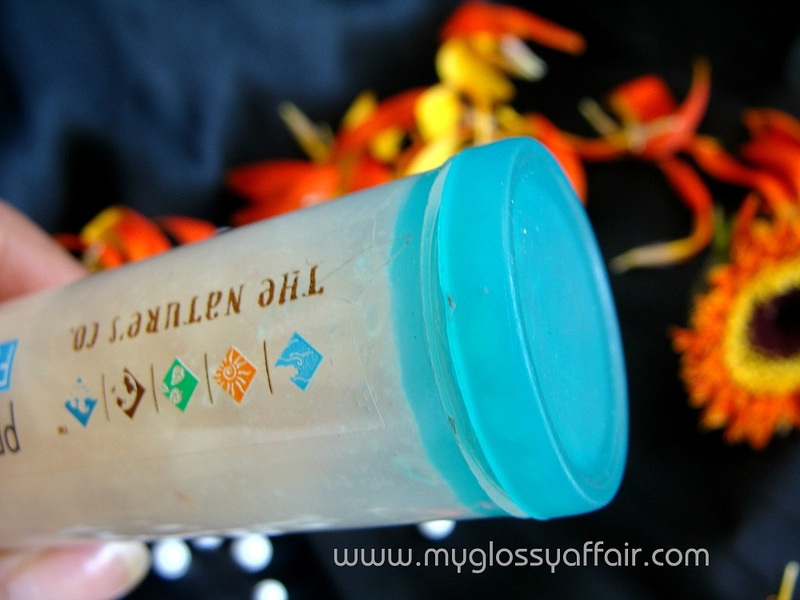 Previously I reviewed “Walnut- Mint foot scrub”, which helps in removing roughness, exfoliates dead skin and softens heels. 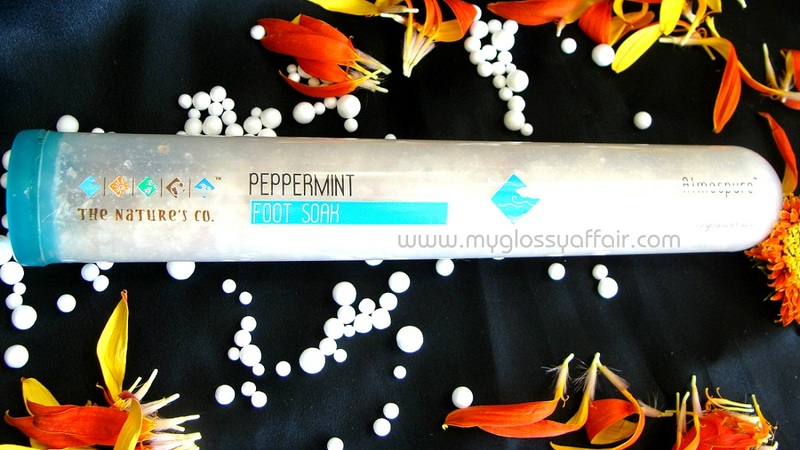 Today the product I am reviewing “Peppermint Foot Soak” is also an essential if you want to pamper your feet at home. Be it humid weather, pollution, sweaty summer or harsh winters, our feet suffer a lot and mostly get ignored. Some of us don’t have time to go out and enjoy the pampering services while others don’t know how to do it at home. As I said I love foot spa but being a working mother of two I don’t get much time to go out everytime I feel the need so I prefer indulging in the foot spa at home. If you want to know how I do it, you can check out the previous post about “DIY: Howto do pedicure at home”, where also I used both the products I have mentioned here. Of course I can’t get that relaxing massage at home but still it’s ok. Gives rest and refreshes tired feet; Soothing; Ease aches and pains. Rest and refresh tired feet with our Peppermint foot soak. Its essential oil will cool and soften, while it’s soothing mineral salts will help ease aches and pains. Use it when you feel like you need that little extra boost of energy after a long day. Your feet will thank you for it! 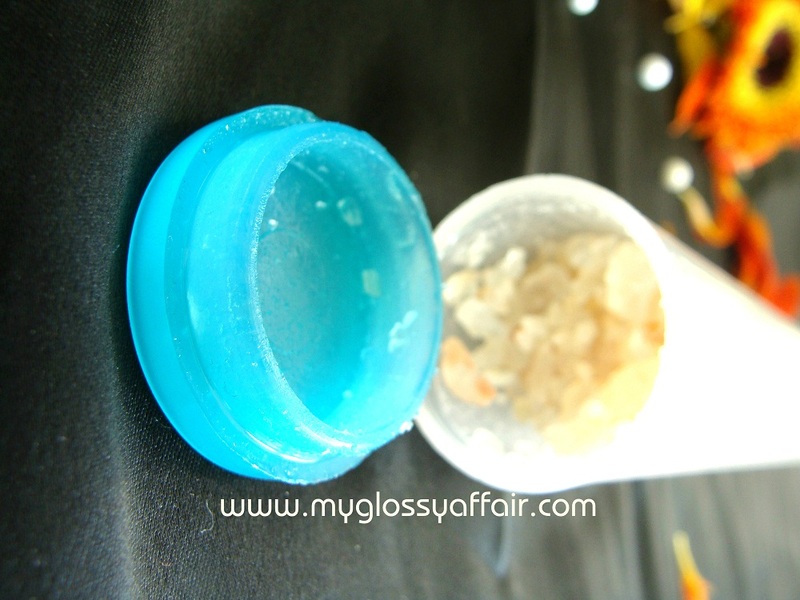 It Soothes, purifies and exfoliates your skin. Sprinkle a small quantity into bath tub and soak your feet for 10 to 15 mins.Your feet will thank you for it! 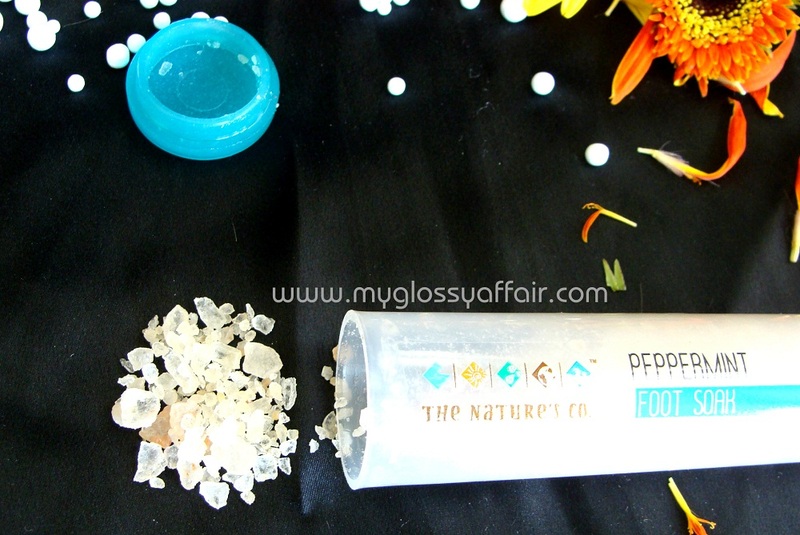 Coming to packaging, this foot soak salt comes in a transparent plastic tube with a green cap. 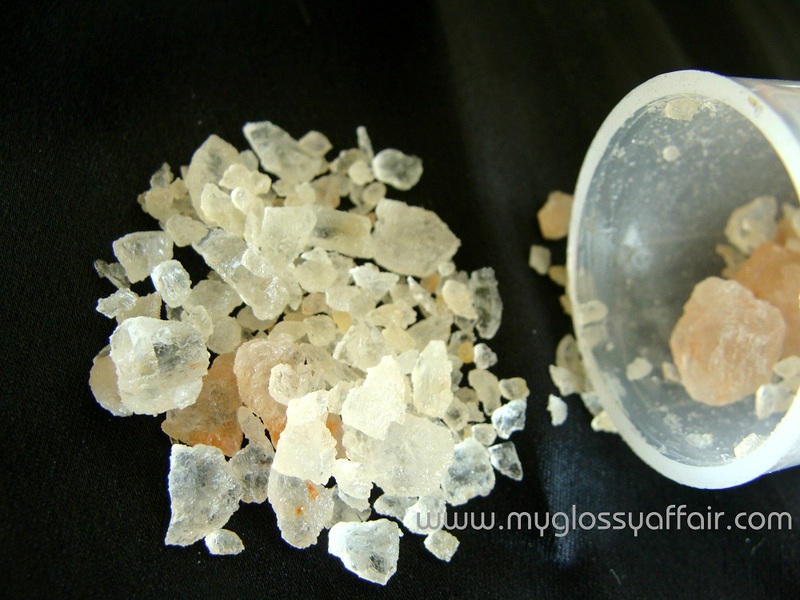 Foot soak is in crystal form and cap is tight enough to keep the product intact. Tube being transparent it is easy to watchout how much product is left. The packaging is absolutely travel friendly. 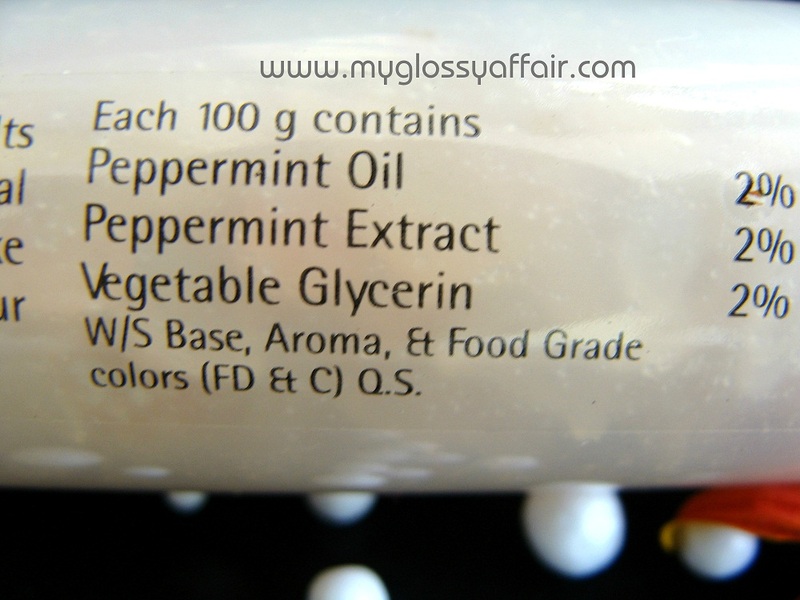 Ingredients: Peppermint Oil, Peppermint Extract, Vegetable Glycerin. I love its fragrance, absolutely refreshing and true to its name..peppermint. 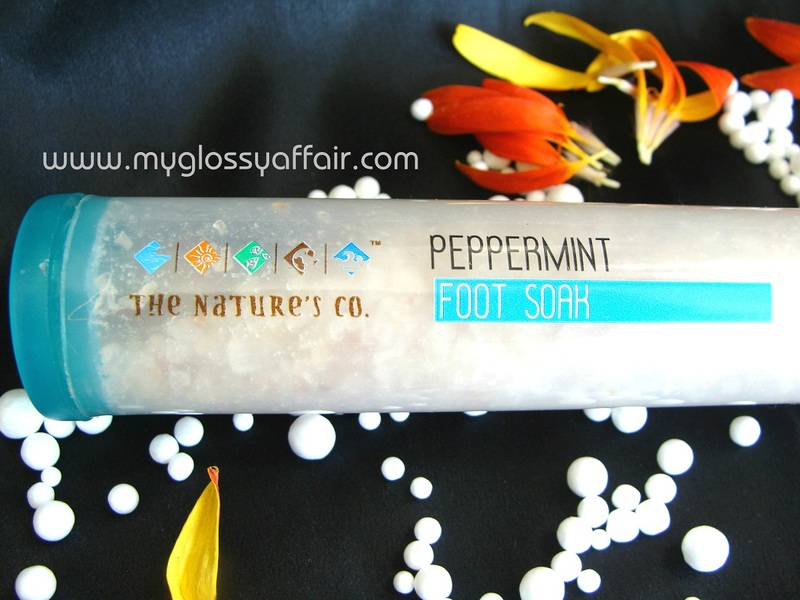 First time I used peppermint foot soak, I did not accompany it with anything else but foot soak..as I wanted to see how good is the product and I found it true to its claim. After a tiring shopping day 😉 when I came back home I really wanted to somewhat relax my tiring feet. So before going to bed I took some warm water in a biiiig bowl and sprinkled Peppermint Foot Soak Salt in it while listening to music and watching my little one playing. My feet all soaked in warm water and the aromatic fresh fragrance..everything heavenly. I loved that it really cured ache to some extent and my feet were feeling really relaxed, even I felt relaxed and I can’t even define the sound and deep sleep which followed later. Such a unique product, wish there was something similar for hands too! 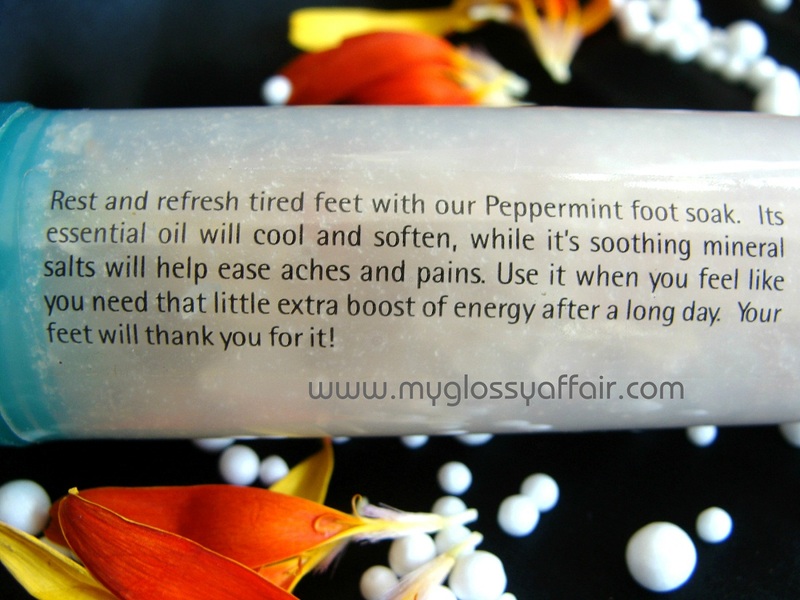 This sounds like a fantastic way to refresh tired feet. I also like the packaging…super cute and very easy to tote around. Nice. One of the things not to say not important but I've never focus much is the feet. Now I should look at it. Would love to try this foot soak. I like it has ingredients you could read peppermint is so good for the feet. Peppermint foot soak sounds devine. Totally wana try this out.